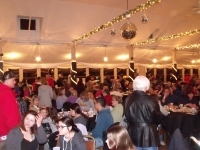 The German Central Organization Hall was filled to capacity, upstairs as well as downstairs. The event included nine pizza vendors: Antonio’s, Casamel’s, Fratello’s, Guy’s, Napoleon’s, State Road, Giovanni’s and Master Pizza, along with Sloppy Bob’s bar and grill. Attendees sampled pizza and voted for their favorite slice. Giovanni’s Pizza won first place. “I really enjoyed the bake off,” said Amanda Keslar of Giovanni’s. “It was great to see the community coming together for an evening of fun. It turned our business completely around and we are busier than ever!” Master Pizza won second place, and Fratello’s and Napoleon’s Pizza tied for third. "Total success!” said Dave Lahman Jr. of Napoleon’s Pizza. “A great way to bring together a collection of the Parma community's own devoted pizza makers to showcase their talents. Cannot wait to be a part of it next year!" The Young Professionals of Parma is using feedback from attendees and sponsors to continue to make improvements for next year’s event.